Cloud plays an essential role in energy budget and climate change. As the “Third Pole” of the earth, accurate cloud monitoring over the Tibetan Plateau is indispensable. The Tiangong-2 Space Laboratory provides multispectral remote sensing data with relatively high spatial resolution and is useful to get an accurate spatial distribution of cloud. 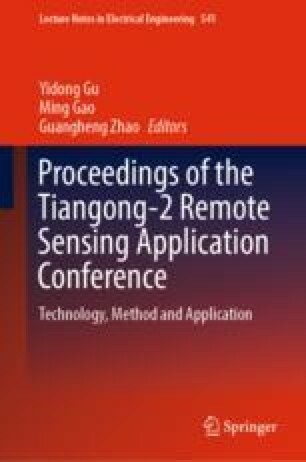 We propose the single band and multiband threshold methods for cloud detection using Tiangong-2 data. To generate appropriate thresholds, the spectral reflectance of the thick cloud, the thin cloud, and land objects were analyzed based on the data from visible to shortwave infrared bands. It was found that the cloud can be accurately distinguished from snow and other land objects including water, ice, bare soil, plant and so on. Compared with Tiangong-2, the geostationary satellite Himawari-8 significantly overestimated the cloud cover over the Tibetan Plateau. The False Alarm Rate (FAR) and the Cloud Hit Rate (CHR) were 29.12% and 94.77%, respectively. Within the incorrectly classified pixels of Himawari-8 data, the cloud types were mainly altocumulus and cumulus. The main reason is probably the difference in classification method and spatial resolution. This work was supported by the key program of NSFC (Grant No. 413311771). Thanks to the China Manned Space Engineering for providing space science and application data products of Tiangong-2. The CLP data used in this paper was supplied by the P-Tree System, Japan Aerospace Exploration Agency (JAXA).